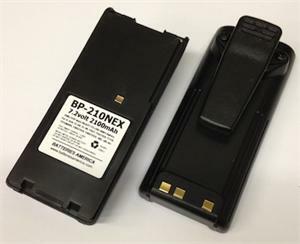 NEW & EXCLUSIVE: BP-210NEX : 7.2 volt 2100mAh rechargeable Ni-MH eneloop battery for ICOM radios. Arrives PRE-CHARGED & READY TO USE. Extra long life ; high watt; high capacity; incudes heavy-duty spring-loaded belt clip. The next generation in hybrid NiMH batteries is now available for your ICOM IC-A24 & IC-A6 radio! Also fits the IC-V8, V82, U82, F3GT, F4GT, F4GS, F11, F11S, F21GM, F21BR, F30GT, F30GS, F40GT, F40GS (all worldwide versions). Replaces BP-209, BP-209N, BP-210, BP-210N, BP-222, BP-222N, etc. These eneloop-technology batteries RETAIN THEIR CHARGE when not being used ! 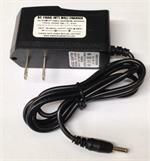 When this battery does require re-charging, it can be done with a desktop charger, such as the EMS-210 or BC-144N. It can also be re-charged thru the radio (with Wall Charger or DC Power Cord), if your radio is equipped with a charge jack on the side. Picture shows front & back of battery; pricing is for ONE battery pack. This product is an Exclusive, high-quality offerring from BATTERIES AMERICA!